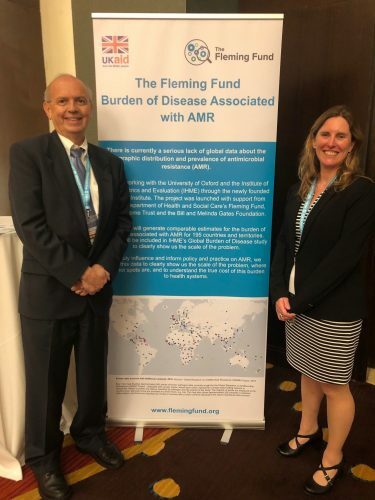 Associate Dean Andy Stergachis (pictured here with Dr. Catrin Moore from the GRAM team) was an invited delegate at the Call to Action on Antimicrobial Resistance 2018 held in Accra, Ghana. He and a team are at work on project, GRAM. They are responding to a Call to Action on Antimicrobial Resistance (AMR) to address the most critical gaps in tackling the development and spread of drug-resistant infections. This Call to Action was hosting by Wellcome Trust, the Ghanaian, Thai and UK governments, the World Bank, and the UN Foundation. The GRAM project is a collaboration between the UW’s Institute for Health Metrics and Evaluation (IHME) and the University of Oxford’s Big Data Institute. Andy is a Senior Investigator with the GRAM project funded by the Wellcome Trust, Fleming Fund, and the Bill & Melinda Gates Foundation.